The Medieval theme transports children to a world of knights and chivalry. 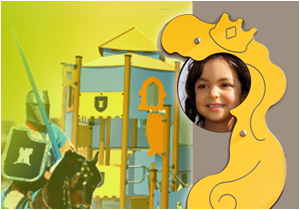 Symbols from this period such as turrets, shields and bridges adorn the play equipment. When combined with children's imagination the equipment becomes the strong point for a host of fun adventures. The numerous play panels add to the theme and test children's problem solving skills.